Bar stools inspired by exotic locals. Island style and Asian barstools. Handcrafted bar stool and counter stool in platinum croc-embossed faux leather (polyurethane). Handcrafted bar and counter stools in platinum croc-embossed faux leather (polyurethane). Handcrafted Valerian counter and bar stools. Silver-hued, crocodile-embossed polyester and cotton with polyurethane backing. Black nickel nailhead trim. Weathered dark chrome-finished maple frame. Made in the USA. Handcrafted bar stool with armrests. Accented with brass footrest on front stretcher. Plantation grown mahogany frame and legs featuring natural jute rope details. Fixed upholstered seat of polyester. Counter stool features fixed upholstered seat. Back of counter stool finished in woven synthetic rattan peel makes for easy cleaning. Plantation grown hardwood frame and legs in a black/brown finish. Double wall back features woven synthetic rattan peel in a mocha finish. Handcrafted bar stool with woven jute rope on seat back. Plantation grown mahogany frame. Seat upholstered in easy to clean and maintain Sunbrella Salt Sailcloth. Handcrafted stool. Double wall back hand-woven seagrass rope with contrast stripe accent. Accented with pewter foot caps and footrest on front stretcher. Hardwood frame. Sunbrella acrylic upholstery. Handcrafted bar stool with croc-embossed leather. Chrome frame. Hardwood seat. Crafted entirely from natural materials, this stool is anything but simple. The open pattern is hand-woven with flat rattan, styled in the traditional cane pattern, though exaggerated in a modern way for a hint of added drama. The frame is also made of rattan, built with round poles for added support, a pole has been added in the low-profile back. The Industrial, 78" Gateway Bar is constructed out of reclaimed wood with metal accent hardware and includes a stone cutting surface, an ice bucket, and ample storage shelving, making it the perfect marriage of industrial looks with new-age functionality Pine frame. Zebra-print hair-on-hide on outside back. Analine leather on inside back and seat. Silvery nailhead trim. Handcrafted swivel barstool and counter stool with vintage appeal. Mango wood seat. Individual grain patterns, knotting, and coloration of the wood will vary; no two are exactly alike. Iron base. Handcrafted counter stool and barstool sold separately. Hand-forged iron frames. Muslin upholstery. Hand-painted finish. Handcrafted, mid-century style counter stool. 18"W x 22"D x 40"T; seat height, 26". Modern S-curves in distressed brown top-grain leather. Architectural, black-waxed, welded iron base. Swivels 360 degrees. Handcrafted barstool. Distressed brown leather seat and back. Welded iron frame. 24"Sq. x 44"T with 15"D x 30.5"T seat. Set of 2 faux leather-upholstered counter stools. Sloping silhouette provides a comfortable seat with seamed construction and angular metal legs and footrest wrapping around. The secret to this piece's versatility is in the details: a yoked back and slightly scooped seat complement its brushed wood grain and tapered legs, making it a comfortable perch for your basement bar or high-top cocktail table. Incredibly durable, renewable, and rich in tonal variation, woven seagrass brings a relaxed style to the dining room. Our barstool's seat and backrest are woven by hand, and its sturdy crossbars double as a place to rest your feet. Incredibly durable, renewable, and rich in tonal variation, woven seagrass and abaca bring a relaxed style to the dining area. Our swiveling barstool’s generous barrel seat is woven by hand to create a spacious, comfortable spot to linger. Handcrafted barstool. Brass-plated iron base. Natural Mongolian (China) fur cushion. Handcrafted barstool and counter stool sold separately. Acrylic and brass. Black and white pattern play on these hair-on-hide stools contrasts beautifully with the modern polished nickel legs. The sleek profile makes these perfect for tucking under a bar. Slim design takes on fresh texture. Slender black iron legs support sling-style seating of faux leather in embossed grey, for a fashion-forward spin on modern bar seating. Handcrafted acrylic bar stool. Steel accents. Handcrafted carved-spindle counter stool. Mahogany frame. Natural seagrass rush seat. Hand-painted, antiqued-white finish. Crafted in India, this industrial iron bar stool is updated with silver foil accents for an elevated look! Finished with sturdy lacquered legs, it’s perfect for pulling up to a bar, table, island, desk or simply as extra seating for guests. Durable iron counter stool is updated with crisscrossing hairpin legs and antiqued gold accents for an industrial-luxe piece. Add it to a bar, counter, bistro table or as extra seating for guests! Crafted in India, this industrial iron bar stool is updated with gold foil accents for an elevated look! Finished with sturdy lacquered legs, it’s perfect for pulling up to a bar, table, island, desk or simply as extra seating for guests. Incredibly durable, renewable, and rich in tonal variation, seagrass and abaca bring relaxed style to the dining room. Frames made of powder-coated iron. Leather upholstery. Dramatic angles and comfortable curves give our Tibetan barstool an Eastern style and versatile shape that are at home in any room. Visible joinery adds a rustic look. Dakota swivel counter stool. 16"Dia. x 25"T. Iron legs with a vintage brass finish. Round mango wood swivel seat with distressed wax finish. Footrest 6" from floor. Dakota swivel barstool. 19"Dia. x 29.5"T. Iron legs with a vintage brass finish. Round mango wood swivel seat with distressed wax finish. Round bar and serving cart with casters, side panels, and glass liner. Iron frame. A stylish look with a brushed copper-tone finish, this bar cart from Martha Stewart Collection provides room for glasses, mixers and more. Casters allow for quick repositioning. 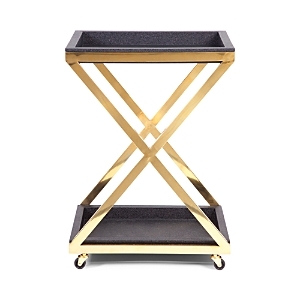 An essential for entertaining, the Gourmet Basics By Mikasa Hadamar Folding Bar Cart moves with the party, allowing you to easily transport bar supplies anywhere in your home or apartment. Its sleek steel and wood design complements any decor and folds closed for storage when not in use. 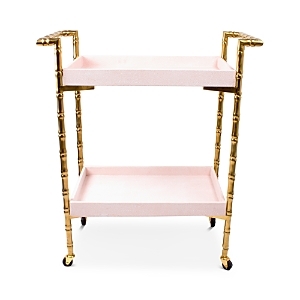 From the dining room to the den, your beverage service is where ever you need it to be with this sleek bar cart from Hotel Collection. Three shelves provide a place for glassware, mixers and more. Beautifully crafted with a vintage brass finish, it features two tiers plated with antiqued mirror glass that has a brilliantly whimsical pattern. So handy, the bar is footed with 360° swivel casters for mobility, which are finished to blend seamlessly into the design. Iron bar cart with glass inserts. Casters. Handcrafted sculptural side table. Solid crystal. 9"Dia. x 20"T. This side table may have clean, classic lines, but thanks to an interpretation in slick, gleaming acrylic, it becomes a fabulous, glam accent piece. Handcrafted side table. 12"Dia. x 25"T. Brass, acrylic, and crystal. Handcrafted martini table. White and grey natural stone hand-cut and inlaid over a fiberglass frame. Stone is natural and may slightly vary by color or grain. Suitable for outdoors. A concrete martini side table with hand-applied gold leaf flames surrounding the bottom of the cylinder. Handcrafted drink table. Stainless steel trim around top and attachment rod. Oak and ash wood frame. Mortise and tenon construction. Handcrafted chest. Made of acacia wood and Macassar ebony veneer inlaid with small mother-of-pearl squares. Two doors with mother-of-pearl door pull. Interior of the cabinet is automatically illuminated by a diffused-light panel of white opal glass when the door opens. Interior is made of maple. Four adjustable curved shelves and two serving slides. Serving slides are faced with foxed mirror (mirror that has been given a worn, antiqued look). Top is inset with foxed mirror framed by convex, quarter-round molding. Handcrafted bar cabinet features carved palm leaves on doors. 53.5"W x 20"D x 75"T. Built of pine solids and veneers with white finish; golden metal base. Two doors open to interior finished in soft taupe. Inside: white marble work surface; one felt-lined drawer with dividers; two scooped-out shelves for wine bottle storage; two adjustable shelves on each side; mirrored back with hanging wine glass holder. Inspired by a 1750s design for garden ornaments "in the Chinese taste" from a rare book in Colonial Williamsburg's library, the Amherst fret-facade pieces will look equally stylish in today's city flat or suburban house. The burnished pewter-colored fretwork is akin to the fashionable English rococo furniture and silver that wealthy patrons such as Jeffery Amherst—Governor-General of British North America—and (absentee) royal governor of Virginia from 1759-68—would have appreciated. Like the well-appointed trunks that were popular during the golden age of rail travel, this piece is built with durability and style in mind. Bar cabinet with two metal louvered, tri-fold doors. Interior: two pull out work surfaces; four wine storage pullout drawers; four storage drawers; wine glass storage; wood-framed adjustable glass shelf; LED light. Finished in a soft, robin's-egg blue, this timeless cabinet captures the charming appeal of a farmhouse piece. The Ardsley Bar is crafted with decorative molding and wire-mesh door fronts, and accented with brushed-nickel hardware for a touch of subtle elegance. Two drawers plus shelves below provide ample storage. Bar cabinet with closed storage. Wood frame; metal accents. Drop leaf ends. Oak and oak veneer wine cabinet. Piano hinge doors. Two doors; four shelves built into each door. Each shelf holds up to four bottles. Horizontal wine rack holds 14 bottles. Two drawers. Black glass work surface; mirror backing behind work area; one glass shelf above work surface. Stemware rack holds up to 14 wine glasses. Built-in light Make your home the destination for holiday parties with this beautifully outfitted bar. Solidly crafted with all the details professional bartenders require, it helps you keep drinks and wine flowing with style and ease. Acrylic and polished-nickel; smoke mirror. Handcrafted serving tray. 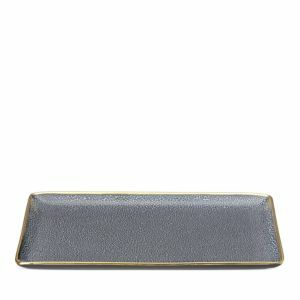 Approximately 22.75"L x 14.625"W x 2.635"T. Resin with embossed shagreen finish. Brass trim. Clear acrylic and polished brass; clear mirror.